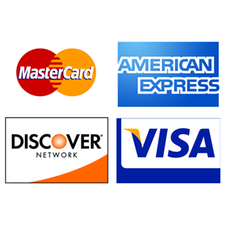 We accept Cash, VISA, Mastercard, American Express, Discover and Care Credit as well as personal checks. Care Credit is a medical credit card. Care Credit allows six months interest free to pay off each charge over $200.00. You can apply by clicking the link on our home page or at carecredit.com or by calling 1-800-365-8295. Care Credit can also be used for human medical costs where accepted.